Ask fellow campers about "Avila / Pismo Beach KOA" and nearby attractions. Sites are too narrow. Your slide overlooks your neighbors slide. Their furnace exhaust is at your front door. Table and chairs go behind your rig. If you have a big rig the site is too short for your truck (you'll have to park your tow vehicle in the overflow). Pool opens late closes early. We camped at Avila / Pismo Beach KOA in a Fifth Wheel. PROS: We enjoyed how close the KOA was to the Avila Valley Barn and the Bob Jones trail. The pool, spa, and playground are nice features. The grounds are kept very clean. We didn't use the on-site restrooms, showers, or laundry. The main office/store has a lot of fun items and supplies to buy. Cable TV and wi-fi were good and had no problems with the other hookups. CONS: The campsites are very tight: they are difficult to get into and you're crammed in very close to your neighbor. There's not much room for a outdoor mat because you're so close to the section of wood fence separating the campsites. There isn't much room for your tow vehicle, especially if there are neighbors in the spots beside you. I was disappointed with how unfriendly the staff person was on the phone. He gives off the vibe that you're inconveniencing him by calling to make a reservation and he has "snippy" replies to your questions. This campground could be more welcoming by improving the attitude and friendliness of those who answer the phone. KOA spa rules say kids age 14 and younger not allowed (not even with an adult). We camped at Avila / Pismo Beach KOA in a Fifth Wheel. Avila Valley Barn is fun especially with kids: great ice cream, desserts, and petting zoo. Bob Jones trail is great for walking or bike riding. Don't let the manager's attitude bother you. Just obey the rules and you won't have any problems. The highway noise is very noticeable when I am outside. It is a nice clean park with many amenities. For those wanting something to do for a weekend this is your place. They even have a outdoor movie theater, pool, hot tub, playground, basketball, shuffle board, dog walk, and a outdoor games. For an overnighter it is convenient on and off the highway. We camped at Avila / Pismo Beach KOA in a Fifth Wheel. Make sure you visit Old West Cinnamon Rolls. Wait until your last day or you will spend too much time eating there. We chose this campground for a one night stop over on our way up the coast due to it's close proximity to the 101. We were pleasantly surprised by all of the amenities and activities they offered, including a free wine tasting in their wine shop (Sat night), activity center with pool table, foosball, Jenga and shuffleboard, free outdoor movie, beautiful pool & hot tub, and $1 ice cream sundaes! The grounds were well maintained and everywhere we went was clean. Our site was extremely small for our 27' trailer and we barely got into it, but once we were in - it was fine. If we had been staying longer, I would have booked a better site. Before we left the next day, we drove into the downtown area of Pismo Beach to look around and also drove into Avila Beach where our kids played on a beachfront pirate playground! For only being there one night - we were able to see and do a lot! We camped at Avila / Pismo Beach KOA in a Travel Trailer. We visited the "famed" Old West Cinnamon Rolls bakery in downtown Pismo, and it was delicious. We also walked around the pier area where we saw Cow #22 "Classic California" of the Cow Parade art project. Took a short drive over to Avila Beach and where our boys played at the pirate themed park. The beach also has a large swingset on the sand and slide that the boys enjoyed! Lots of great little eateries to explore! Although older, this KOA appears to be well maintained and kept. All sites are slippery, large sized gravel rocks. The HWY 101 noise was terrible. And for the outrageous price, there is no way we would ever stay here again. There is no pet area other than grass on the side of the road outside the park. The laundry was clean and very costly and the the wifi was weak to say the least. Keep driving, Folks! We camped at Avila / Pismo Beach KOA in a Fifth Wheel. Despite the rather poor reviews, the Avila KOA is one of the nicest KOA parks we have stayed at. It used to be an owned space park, which was purchased by KOA. There are about 80 gravel sites with full hookups, and another 20 or so cabins. Pool is clean and heated, along with adjacent spa. Grounds are exceptionally clean, with very well maintained gardens. Paved streets appear to be frequently swept. There are several picnic tables, grills, and fire pits in the grass and garden area. Other features include an outdoor movie screen in a large sand area, horseshoes, shuffleboard and kids playground. Near the office/store, is an inside game room. Propane is sold on site. Staff are very friendly, helpful and visible. There are limited big-rig sites, and only 3 pull throughs. Spaces 4-9 are big rig, but in shade all day. Spaces 79-89 back to the 101, and have moderate shade. I recommend sites 67-76, which are full sun, big rig and furthest from highway. Freeway noise is heard from anywhere in the park, but we did not find it bothersome. This park tends to fill up last, because it is not near the beach. However, it is a short drive away from the beach, and is close to the Bob Jones trail, where you can bike to the beach without dealing with cars. We would definitely stay here again. We camped at Avila / Pismo Beach KOA in a Motorhome. 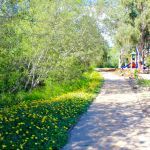 Bike or hike the Bob Jones trail. Visit Avila Beach. Visit San Luis Harbor Port area - hike or drive out on the pier. Hike to the Point San Luis Lighthouse (Weds or Sat. Docent led hikes). Take the Trolly to the Lighthouse (Weds or Sat) - reservations required for Hike or Trolly. Drive to Pismo Beach. Visit San Luis Obispo (SLO). Visit SLO Thursday night farmers market downtown. New owners have done a lot of work upgrading this cg. Very clean; new redwood fences separate you from your neighbors utilities; level sites; nice game room; very nice pool area and walkways. Owners initially had trouble finding/training/keeping good managers, leading to some negative reviews about the staff, but over four days, we interacted with three different office/store personnel and were treated very nicely and with great courtesy. I believe this cg has made a great turn-around. Freeway noise was noticeable from our site but we turned on the fan at night and slept well regardless. They have a good store with an unexpectedly broad wine selection. Site 81 was double-wide because of a shade tree that bisects it - I think its the best site they have. Our fees averaged $60 over 2 weekday and 2 weekend nights, with our KOA discount - fees are higher for Friday & Saturday nights. Considering the high prices we've seen elsewhere along the CA coast, I think this discounted fee is about average. We will definitely camp here again. We camped at Avila / Pismo Beach KOA in a Travel Trailer. Avila Beach (Front St) is about 5 minutes away and has a variety of nice shops, restaurants, bars and etc. to enjoy. We ate at the Custom House restaurant several times and recommend it. Shell Beach and Pismo Beach are only 10 minutes away too. The Avila Valley Barn is close enough to walk to, featuring fresh fruits & vegetables, nuts, kitchen accessories, gift items, a petting zoo, and etc. It seemed modern and upscale, but prices were down-to-earth. Very convenient to the freeway; we thought a bit expensive but it did have a nice pool and spa. Manager wasn't very friendly and you have to sign agreement to the rules - not a huge deal. It is a non-smoking park so you can't smoke anywhere in the park - that's fine for us but should be disclosed when you book in for folks that do smoke. Would have given it a higher rating except for our space not being large enough for our rig and not having any water the next morning. Evidently there was a problem but no notification was given; no notes on the bathrooms. People got all the way into the showers before finding out there was no water. When questioned about notification the manager was very rude (as he stood watching someone dig a hole near the leak) We realize things happen but how a manager handles it is important. Ignoring your customers and being rude isn't the right way to do it. We camped at Avila / Pismo Beach KOA in a Travel Trailer. Although very convenient we wouldn't stay again because of the manager's attitude. Rv sites were too close. No cement pad. Picnic table barely fit, had to go towards the back of our neighbors rv. People parked anywhere. Wifi was good. Great bike ride trail would stay just for that. We camped at Avila / Pismo Beach KOA in a Travel Trailer. Ride the trial to beach. The park is convenient to Cal poly, which I sent the reason for our visit. Very close to scenic venues. My only complaint is the size of the sites. Extremely narrow and difficult to back in to. Neighbors slides inches from mine and sanitary connections are in your front door. Additional charges for visitors. WiFi weak and slow. Lots are clean as well as the restrooms. Great for a short or overnight stay. We camped at Avila / Pismo Beach KOA in a Fifth Wheel. It was really small and tight like sardines. Not clean. Staff was nice. Managers were rude. I will not stay again. We camped at Avila / Pismo Beach KOA in a Motorhome. We stayed here one night while visiting a friend in Avila Beach, and this park is very convenient to both Avila and Pismo. The park itself is next to and slightly below Hwy 101, but we didn't have any road noise. The sites are gravel, and fairly level. There are lots of nice pine/fir trees around the perimeter and spaced throughout the park. The bathrooms and showers were adequate, but not what we have come to expect from a KOA. It looked like the staff was working on some of the cabins, which is good. This park looks older and would benefit by a spruce-up. That being said, we would stay here again next time we are in the area. We camped at Avila / Pismo Beach KOA in a Motorhome. This park surprised us because it appears you are surrounded by trees and forest type areas. However, knowing that Avila Beach and the ocean was on the other side of the mountain, we started exploring and found the Bob Jones Trail, which is a 2.5 mile walking/bicycle path leading to the town of Avila and the Port San Luis. So convenient for travelers to have easy access to sites and restaurants, etc. so close by. The reason we were there was the RV parks, whether private or public in nearby Pismo Beach were all filled up for the Columbus Day long weekend. The closest to the beaches and with vacancies was a stroke of luck for us. We found the Avila Valley Barn, a farmers type market across the road from the RV park and enjoyed it very much. Now this KOA RV park will be a regular stop for us. We camped at Avila / Pismo Beach KOA in a Motorhome. 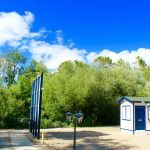 After reading reviews we were skeptical of staying at this RV park. However, it was close to our 2 families in the area and near Avila and Pismo Beaches that we love. It was great. The staff was friendly and helpful as well as knowledgeable of the area. The sites were clean. Our site had plenty of room for our 36' fifth wheel and truck. There are many sites that are tight but doable. Everything worked: cable, Wi-Fi, water, electric, and sewer. Our site was not backed up to the 101 freeway and we did not notice much noise, when walking our dogs in that area it was noisier. The location was great with many activities in the area. We will stay here again. We camped at Avila / Pismo Beach KOA in a Fifth Wheel. Hiking, beach, whales cave by the clothing optional beach, one dog party beach 3 miles, harbor, shops, golf, all within walking distance. Close by are Pismo beach views, the monarch butterfly sanctuary at Pismo State Park. Morro Bay is close and has great sea otters. There is so much to do and see just read about the areas. We love the Central Coast. We stayed here over the Thanksgiving Day weekend for 4 nights. Our site backed up to a grassy area. We didn't have room to put our awning out but other sites seemed to have more room. I would ask for a specific site to meet your needs. The pool was supposed to be heated but heater was broken and they couldn't get anyone out on a holiday weekend. Hot tub was fine and the pool area is nice. They did a morning breakfast which was a good value and it was tasty. They do have a dog breed policy but doesn't seem to be enforced, well behaved dogs welcome. Our dog had a great time playing with another dog. Office sells beer and wine. Right down the road in walking distance is the Barn. Deli, farm animals and fresh produce, pies and plenty of stuff. There is some freeway noise from highway 101. Bathrooms and showers were basic but clean and functional. We will return. We camped at Avila / Pismo Beach KOA in a Motorhome. If you have a car, the beach and town is 3 miles away, plenty of stores within 15 minutes. 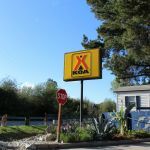 Are you affiliated with Avila / Pismo Beach KOA ?